Indications: Selective-serotonin reuptake inhibitor commonly prescribed for depression, panic disorder, anxiety disorder and other mental health conditions. Zoloft may be prescribed for off-label purposes as deem appropriate by the prescribing physician. Summary Recommendations: Zoloft is an SSRI anti-depressant. Zoloft should not be taken within two weeks of taking an MAOI inhibitor. Patients with liver disease, bipolar disorder, bleeding disorder, seizures or chronic disease of any kind should talk with the prescribing physician about potential side effects of contraindications before starting Zoloft. General Precautions: Zoloft is commonly prescribed in patients with depression or mental illness/disorder. It is best to take the medication exactly as prescribed. Never take more or less than the prescribed amount without express instruction from the prescribing physician. Patients with a history of suicidal thoughts should not take Zoloft. If you have thoughts of suicide while taking Zoloft, contact your physician immediately. Common side effects reported in patients taking Zoloft include nausea, dry mouth, reduced libido, insomnia, impotence and appetite changes. More serious side effects may include rigid muscles, confusion, headache, weakness, overactive reflexes and tremors. It is important to keep your prescribing physician informed of any and all side effects. Zoloft may not be safe if you are taking medications to control blood pressure, depression, bipolar disorder, cough, migraine headaches, pain or seizures. Tell the prescribing physician about any and all medications you are currently taking, including over-the-counter medications and supplements. Effect While Trying to Conceive: At least one animal study has reported a negative effect on fertility. The animal study tested Zoloft doses four times that prescribed to humans. No human studies have been completed. Effects on Pregnancy: Zoloft is in pregnancy category C because negative effects on pregnancy and/or fetal develop have not been ruled out. While no satisfactory controlled studies on humans have been completed, infants born to mothers taking Zoloft have experienced longer than normal hospitalization for respiratory distress, apnea, seizures, vomiting and other complications. SSRI intake in late pregnancy has been associated with persistent pulmonary hypertension of the newborn, also known as PPHN. 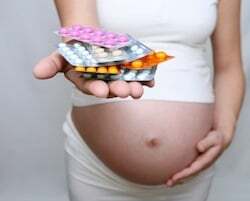 Your prescribing physician and obstetrician will help you weigh the benefits and risks of taking Zoloft while pregnant. It is not safe to stop taking Zoloft without talking with your prescribing physician first. Safe While Breastfeeding: Zoloft is considered one of the safer antidepressants for breastfeeding mothers. The SSRI is not present in detectable amounts in blood serum testing. Infants with impaired metabolic function may accumulate Zoloft. Risks of taking Zoloft while breastfeeding should be discussed when metabolic impairment is diagnosed.